Style 1: 3 layers with lace edge, hoopless, waistline: 19"-35"=48-89cm, Length:15"=38cm. Style 2: adjustable waist with self tie,A-line 3 Hoops,Full Length :20''=50cm,Max Width 25''=63.5cm. Style 3: with self tie to adjust the waistline. style 4: elastic band waistline 23.62''-39.37''=60-100cm, Item Length:19.68''=50cm. style 5: with self tie to adjust the waistline.Item Length:13.78''=35cm. style 6: Max Elastic is around 30''=75 cm.Item Length:17.7''=45cm. 1.Items shipping will be arranged within 24-48 hours after order payment finished. 2.Standard Shipping Service will take about 10-15 days. If you need it urgently,please contact us and choose Expedited Shipping. 3.Some of the items are Fulfilled by Amazon Prime with Second-Day Shipment. Note:Size is the manual measurement, because of the different measure methods for each person ,there may be errors 1-2cm. 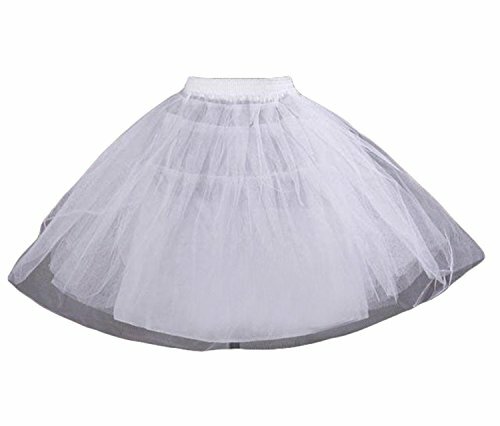 Every style petticoat slips is different from the details measurements. Please see details measruement under below Product Description, and then CHECK IT carefully while select the best one for your girls. Style 1: 3 layers with lace edge, hoopless, waistline: 19"-35"=48-89cm, Length:15"=38cm.Style 2: adjustable waist with self tie,A-line 3 Hoops,Full Length :20''=50cm,Max Width 25''=63.5cm.Style 3: with self tie to adjust the waistline. style 4: elastic band waistline 23.62''-39.37''=60-100cm, Item Length:19.68''=50cm.style 5: with self tie to adjust the waistline.Item Length:13.78''=35cm.style 6: Max Elastic is around 30''=75 cm.Item Length:17.7''=45cm. Perfect for weddings, party, dance, birthday, festivals, communion, holiday and other special occasion dresses. If you have any other problems or doubts about our products, please feel free to email us. About Delivery:Please ignore the date set by Amazon auto.In general,if you place order without any question items will ship in 24-48 hours, standard shipping need 10-15 days, fast shipping 3-4 days.Some items are Fulfilled by Amazon. If you have any questions about this product by Dannifore, contact us by completing and submitting the form below. If you are looking for a specif part number, please include it with your message.